CIYMS made it through to their third consecutive Arthur J Gallagher Challenge Cup final with a hard-fought four-wicket win at Moylena. The day’s real story though came 30 minutes after play finished and concerned opponents Muckamore. “Jonty asked to talk with me after the game and told me his mother was seriously ill; it was the first I was aware,” he said. “It speaks volumes for him that he said nothing all day as he knew the importance of the game to the club and he didn’t want the guys distracted. “As a club, we are obviously fully supportive, at times like this family comes first. He has really fitted in well. “The thoughts of all at Muckamore are with him and his family at this difficult time. A replacement for Rapulana is key for the remainder of Muckamore’s season, considering Lisburn’s victory over Instonians yesterday they now find themselves joint bottom of the table. On the pitch, surprisingly Muckamore elected to bat. At first Sam Gordon and Rapulana took advantage of some errant deliveries from Allen Coulter. Weather interruptions were always a possibility and they dealt the home side a particularly harsh hand. 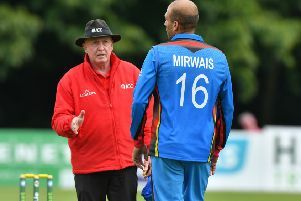 With rain falling Ifti Hussain was bowled by Matt McGillivray and on the first ball after resumption. Then Ryan Haire feathered one to Chris Dougherty and suddenly it was 49-4. McGillivray bowled superbly, exploiting favourable conditions. Jason van der Merwe on the other hand had the distinction of being removed from the attack after consecutive beamers to Jamie Magowanm with no malice intended. Jacob Mulder then took 3-6 before McGillivray returned to remove the obdurate Gill for 28 and Muckamore were 116 all out. The home side are nothing if not fighters, Gill and Gary Nicholl opened the attack, Dougherty attempted to pull Nicholl and was superbly taken by Rapulana. Gill then clean-bowled Ryan Hunter, next ball pinning Nigel Jones plumb in front and it was 9-3. John Matchett and Van der Merwe settled things, before the former became Gill’s third victim. Then by the time Mulder went in similar fashion it was too little too late and McGillivray 30 not out combined with his 5-15 ensured he took the man-of-the-match honours .